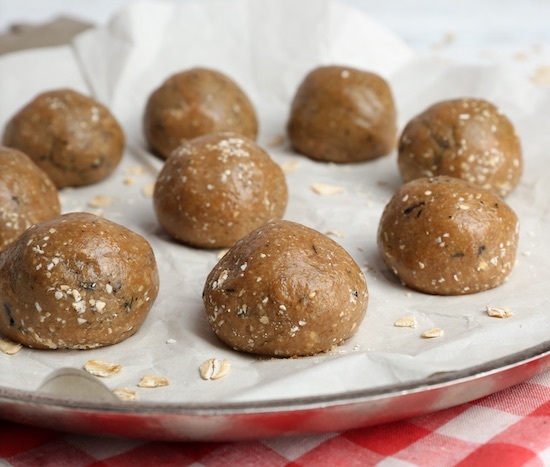 These little energy bites are super easy and family friendly! Even if your kids aren’t crazy about almonds, they will love them in this form. You can substitute any other nut butter in place of the almond butter if you wish. Place 2 cups of rolled oats in a food processor and pulverize. This turns the oats into somewhat of a thick powder. Add 16oz of almond butter and 1/3 cup of maple syrup to the food processor, and blend until the mixture comes together. If it’s too thick, consider adding a touch more of your wet ingredients or a little bit of water. Roll the dough into bite-sized balls and store them in the refrigerator. Try adding protein powder, flax seed, chia seeds or unsweetened coconut flakes for a nutritional boost. Once chilled, consider dipping them in melting chocolate to make a healthier version of a truffle.